ABSTRACT. 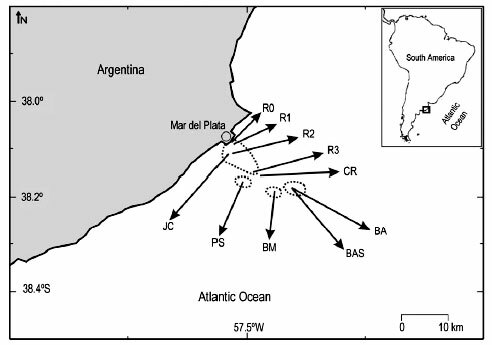 This study describes the macrofaunal assemblages of subtidal rocky reefs off Mar del Plata in order to compare the macro invertebrate assemblages settled on shipwrecks with those of nearby reef sand to characterize the fish fauna associated with natural (NR) and artificial (AR) reefs. Topographic characterizations and surveys of invertebrates and fishes were performed in November and December 2005, using SCUBA diving. A non-parametric multivariate analysis was used to analyze the environmental and biological data. The reefs were mainly distinguished by their depth and the position of the substrate. The red calcareous algae, Corallina officinalis, dominated the shallowest NR, whereas conspicuous mytilid assemblages of Mytilus platensis were present at depths over 3 m, sea anemones, Anthothoe chilensis, were more abundant between 6 and 10 m, and the soft coral, Tripalea clavaria, was found at nearly 20 m depth. No differences were found between horizontal ARs and the adjacent NRs. The greatest differences were found between the communities of vertical and horizontal substrates, both in NRs and ARs. Fifteen fish species were recorded in the analyzed area. Species having strong site fidelity, e.g., Acanthistius brasilianus and Pseudopercis semifasciata, were clearly more abundant and/or frequent in ARs (shipwrecks) than in NRs. This pioneer study in the surveyed area showed that reef sallow the settlement of diverse benthic assemblages. ARs also provide refuge for fishes. As sport fishing and diving are activities being carried out in Mar del Plata, where tourism is one of the main economic resources, the protection of such areas should be considered in conservation plans. 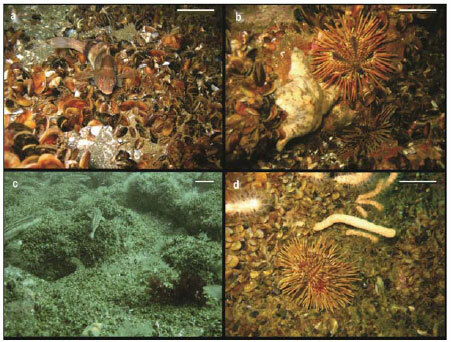 Keywords: natural and artificial reefs, benthic communities, Mar del Plata, southwestern Atlantic. RESUMEN. Se describió la macrofauna de los arrecifes rocosos sublitorales, frente a Mar del Plata, para comparar las asociaciones de macro-invertebrados de los pecios con las de los arrecifes aledaños y caracterizar la fauna de peces tanto en los arrecifes naturales (NR) como artificiales (AR). Las caracterizaciones topográficas y los censos de invertebrados y peces se realizaron mediante buceo autónomo en noviembre y diciembre de 2005. Los datos ambientales y biológicos fueron analizados mediante análisis multivariados no paramétricos. Los arrecifes fueron principalmente discriminados acorde a su profundidad y posición del sustrato. El alga roja calcárea Corallina officinalis fue dominante en los NR poco profundos, mientras que conspicuas asociaciones del mitílido Mytilus platensis se encontraron a más de 3 m de profundidad; la anémona de mar Anthothoe chilensis fue más abundante a los 6-10 m y el coral blando Tripalea clavaria cerca de los 20 m de profundidad. No se evidenciaron diferencias entre los ARs de disposición horizontal y los NR aledaños. Las mayores diferencias fueron halladas en las comunidades de los sustratos verticales vs horizontales tanto en NRs y ARs. Se registraron 15 especies de peces. Aquellas con fuerte fidelidad por el habitat, e.g. 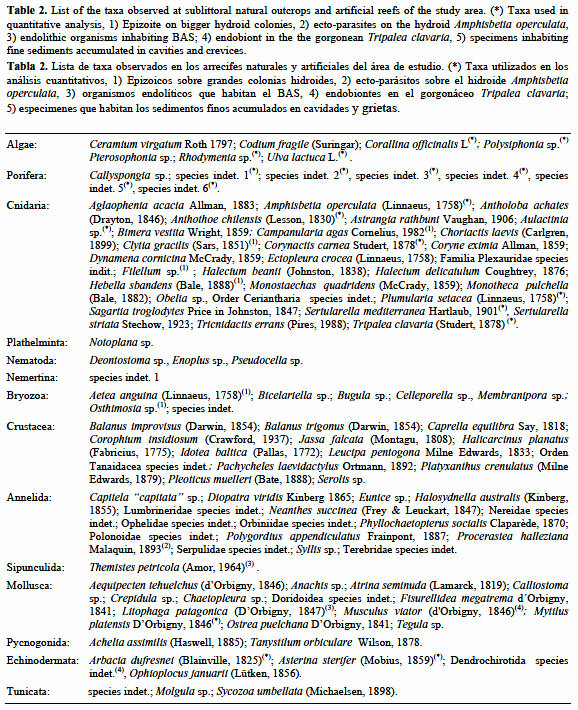 Acanthistius brasilianus y Pseudopercis semifasciata, fueron claramente más abundantes y/o frecuentes en los ARs (pecios) en comparación con los NRs. Este estudio pionero en el área mostró que los arrecifes permiten la fijación de diversas asociaciones bentónicas. Los ARs aportan además refugio para los peces. Debido a que la pesca recreacional y el buceo son actividades que se están desarrollando en Mar del Plata, donde el turismo es uno de los principales recursos económicos, la protección de estas áreas debería considerarse en los planes de conservación. Palabras clave: arrecifes naturales y artificiales, comunidades bentónicas, Mar del Plata, Atlántico sudoccidental. During the past years, the fishing effort has increased and coastal resources had been more heavily impacted due to trawling in Buenos Aires (Bertolotti et al., 2001, 2008). Bottom-trawl fisheries disturb benthic communities and habitats and can reduce biomass, production and diversity, which at the end may change ecosystem properties (Collie et al., 2000; Kaiser et al., 2000; Hiddink et al., 2006a, 2006b). Within this context, natural reefs (NR), a strip or ridge of rocks or coral that rises to or near the surface of the water, provide refuge to coastal fishes and habitat to numerous invertebrates and algae as they cannot be disturbed by demersal fishing activities. Accordingly, artificial reefs (AR) have been suggested as a tool for the conservation of biodiversity, mitigation and rehabilitation of habitats under anthropogenic impacts (Perkol-Finkel & Benayahu, 2005, 2007; Perkol-Finkel et al., 2006). An artificial reef is one or more objects of natural or human origin deployed purposefully on the seafloor to influence physical, biological, or socio-economic processes related to living marine resources (Seaman, 2000). Accidental shipwrecks have been also classified at times as AR. This definitions reflects hypotheses that the ecological processes of artificial reefs are (or should be) functionally equivalent to those of natural benthic systems in an area (Seaman, 2000). If the last is true, after a long term period of submersion we could expect that ARs and NRs will have a similar community structure (Perkol-Finkel et al., 2006). On the contrary, if the AR is not mimicking the NR in a proper way, the resulting benthic communities should differ (Glasby & Connel, 2001). The use of AR to mitigate the effects of human activities has been stressed out by fisheries managers and conservation biologists. However, there is still a debate regarding their performance in attracting fish resources from the surroundings and depleting them or enhancing production in the whole area, otherwise lost (Carr & Hixon, 1997; Grossman et al., 1997; Svane & Petersen, 2001). In the case of epibenthic organisms, the introduction of an artificial habitat clearly increases the local production of fouling assemblages; its structural complexity and submersion period affect the colonizing community (Baine, 2001; Svane & Petersen 2001; Perkol-Finkel et al., 2006). Mar del Plata coastal area is characterized by numerous rocky outcrops that extend from the intertidal to several miles seawards, up to 25 m depth. The outcrops and surrounding areas are subjected to many human activities, including commercial and recreational fisheries and diving. In addition, some shipwrecks have built extended AR during the past decades, which provide hard substrata suitable for the recruitment of benthic and refuge for fish species. The fauna and habitats remain largely unknown in the study area; only some cnidarian groups were surveyed (Genzano et al., 2002; Excoffon et al., 2004). On the other hand, diving at Mar del Plata outcrops is a more recent focus for the diving centers of the region, who have proposed the creation of submarine parks to boost diving activities in these almost unknown marine communities. In this paper we study the benthic communities of coastal outcrops off Mar del Plata (both natural and artificial reefs). The main goals are 1) to describe for the first time the macrofaunal assemblages of subtidal hard bottoms, 2) to compare the macrobenthic assemblages settled on shipwrecks with nearby outcrops to determine the effectiveness in reflecting the natural communities of the region, after a long-term period of submersion (60 years), 3) to characterize the fish fauna associated with NRs and ARs, and 4) to obtain reliable information to management and conservation of these coastal habitats. Buenos Aires coast comprises sandy beaches and numerous isolated intertidal hard bottoms of loess (consolidated sedimentary rocks, Pleistocene). The coast off Mar del Plata city is exceptionally different due to the presence of quartzite rocks originated in the Tandilia mountainous system (SE of Buenos Aires Province), during the Ordovician, which extends several miles seawards up to 25 m depth (Genzano, 2010). The sublittoral rocky area is estimated at ca. 14 km2 and constitutes the largest hard substrate in the zone. Although the area is indicated as continuous in the nautical charts, it is actually a group of isolate outcrops of variable size surrounded by sand and shell debris and with different physiognomy and faunal composition. The outcrops are well-known to divers and fishermen, which commonly named them Restingas (outcrops up to 12-14 m depth) and Bancos (outcrops 18-23 m depth) (Fig. 1). These outcrops are conformed by big fragmented quartzite boulders, with the exception of a sedimentary slope originated during the Quaternary period (Neozoic era) which is located over the ortoquarcitic rocky floor in Banco de Afuera. This slope is 1-1.5 m height conformed by a more fragile consolidated sedimentary rock (coquina with abundant shell fragments). The area is affected by a littoral current (south to north), semi-diurnal tidal currents and high-energy waves; storms and winds from SE are frequent, mainly in autumn and winter (Lanfredi et al., 1992). During this period big amounts of sand and fragments of mollusk valves accumulate in depressed areas and crevices. Storms and winds notably produce sediment re-suspension. Consequently, diving is usually developed under dangerous conditions, with water visibility ranging between 0.5-6 m, average 3 m. Water temperature is variable through the year, maximum summer values reach 18-19°C and minimum winter values of 7-8°C were recorded. Six vessels sank in the area more than 50 years ago, which also denotes the difficult conditions for nautical activities. The shipwrecks of the freighter James Clunies (149 m length, sunk in 1949 at 10 m depth), over a restinga are frequently visited by local divers. In addition, in 1981 a submarine park was built on soft bottoms close to Restingas and Bancos, by sinking the wood-vessel Cristo Rey (45 m length) at 22 m depth, thus creating another site of interest for divers (Iñurieta, 2005; Genzano, 2010). Several exploratory dive surveys were conducted between July 2000 and May 2005 in the study area with the aim to provide an assessment of the habitat types and to select sampling sites. All census and collections were carried out by SCUBA diving at the different rocky outcrops and artificial reefs (shipwrecks), between 1 and 23 m depth. A total of 26 dives (-900 min of immersion) were performed during the study. Topographical characterization and macro-invertebrates census were performed during November and December 2005, austral spring (a period in which most species would likely be present) in 11 sites: Restingas Faro (R0), Primera (R1), Segunda (R2) and Tercera (R3), Bancos Pescadores Sur (PS), del Medio (BM), Banco de Afuera (BA) and the sedimentary slope in BA (BAS) and shipwrecks James Clunies vertical (JCV) and horizontal (JCH) substrata and Cristo Rey (CR) (Fig. 1). Figure 1. Location of sites surveyed in this study. Natural outcrops: Restingas Faro (R0), Primera (R1), Segunda (R2) and Tercera (R3), Banco Pescadores Sur (PS), Banco del Medio (BM), Banco de Afuera (BA) and the sedimentary slope in BA (BAS). Artificial reefs (shipwrecks): James Clunies, (JC) and Cristo Rey (CR). Dotted lines: continuous outcrops formations. Figura 1. Localización de los sitios examinados en este estudio. Arrecifes naturales: Restingas Faro (R0), Primera (R1), Segunda (R2) y Tercera (R3), Banco Pescadores Sur (PS), Banco del Medio (BM), Banco de Afuera (BA) y elevación de roca sedimentaria en BA (BAS). Arrecifes artificiales (pecios): James Clunies (JC) y Cristo Rey (CR). Líneas punteadas: formaciones arrecifales continuas. In each site three parallel 10 m chains, horizontally positioned, separated by 5 m were laid out at random, performing line-intercept transects (Loya, 1978), writing down the nature of the substrate (coverage over the length on the chain), according with predefined categories of substrata (modified from Woodman, 1999): boulders (human size or bigger), rocks (size of an arm or legs), stones (hand size), pebbles (finger size), mud/sand/bioclast (fine particle). Live cover of conspicuous macrobenthic organisms (algae, sponges, cnidarians, blue mussels, sea stars, sea urchins) was also measured. These data provided information on the relative cover of major benthic groups, used to define community types. Coverage was recorded counting the number of chain links covering the different species, method previously used in cnidarian's censuses in the area (Genzano et al., 2002). In addition, qualitative samples were collected in some particular microhabitats to identify taxa when stereoscopic microscope observation was needed in order to give the baseline inventory list from this almost unexplored area, which was complemented by underwater observations and video recording conducted during 2007 and 2008 using rovers diver transects (RDT). As a measure of topographic complexity, the Rugosity index (Ri) was calculated using the ratio of a length of the chain moulded to the surface to the linear distance between its start and end points and it was expressed as percentages as follows: Ri (%) = (1-[length of chain in situ / total length of chain]) x 100 (Luckhurst & Luckhurst, 1978; Francour & Koukouras, 2000). In addition, the Cavity index (Cav), was calculated as follows: Cav = B2. 100/(A2+B2), where "A" is the mean size of the external face of blocks and "B" is the mean size of cavity apertures between blocks and rocks (Ruitton et al., 2000). Average height, the distance from the bottom substrate to the top of the 10 highest blocks within a transect, was also estimated as other assessment of habitat architecture (Gratwicke & Speight, 2005). Quantification of fishes represent a special problem because of their mobility, hence censuses are necessary subjective and reliant upon water condition. Visual censuses were performed swimming freely throughout a dive site during 15 min in each survey and recording every fish species that could be positively identified (Lessios, 1996). Since local species do not conform dense fish schools, each recorded species was assigned into one of four relative abundance categories (modified from Pattengill-Semmens, 2001): occasional (O): a single individual, scarce (S): 2-5 individuals, abundant (A): 6 a 10 and very abundant (Va): more than 10 individuals observed during the immersion. Frequency was calculated as the ratio between numbers of dives in which a species was found and the total dives conducted. Three categories were assigned: less frequent (LF): recorded in less than 20%; frequent (F): recorded between 20-50% and very frequent (VF): recorded in more of the 50% of total dives. A non-parametric multivariate analysis was applied to environmental and biological data. Similarity of sites using physical variables (depth, substrate categories and topographic complexity) was determined by ordination methods (MDS, using group average sorting of the Euclidean distance of physical data). In a similar way, changes in species composition among sampling sites was determined by ordination methods (MDS, group average sorting of the Bray-Curtis similarity measures on cover data) using PRIMER software (Clarke & Warwick, 2001). 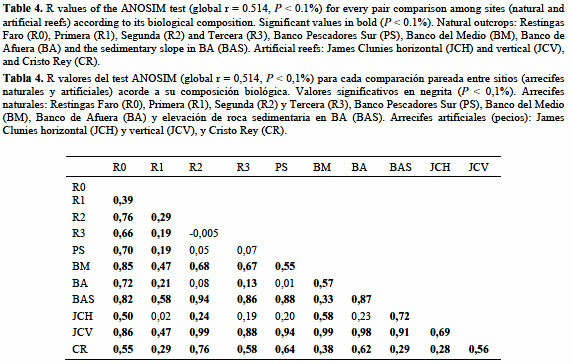 The SIMPER analysis (similarity percentages) was used to identify those species which contributed most to (dis)similarities among and within groups. This analysis calculates the "average similarity" (contribution of the ith species to the overall dissimilarity between the groups considered) and the "internal similarity" (contribution each species makes to the average similarity within each group considered) (see Clarke & Warwick, 2001 for details). The ANOSIM test was used to search for differences between groups of sampling sites (R0 to CR: natural vs artificial reefs, horizontal vs. vertical communities). This permutation test analyses composition differences between replicates within sites contrasted with differences between sites, computing an R-statistic under the null hypothesis "no differences between sites". R falls between -1 and 1, so R is ~0 if the null hypothesis is true and R = 1 if all replicates within sites are more similar to each other than are replicates from different sites. Finally, the BIO-ENV procedure was used to determine which set of environmental variables (similarity calculated with the Euclidean distance coefficient) best explains the biological matrices (presence-absence data, using Bray-Curtis similarity measure) (Clarke & Warwick, 2001). The first sublittoral Rocky Outcrop (R0) is located 300 m off the costal line; its shallower zone remains partially exposed to the air during extraordinary low tide. This outcrop is conformed mainly by boulders and big rocks which reach 1-2 m depth. Other two outcrops of similar topography (R1 and R2) are found between 5-10 m depth. Conform the depth increases, rocks and stone coverage are more important and, consequently seafloor roughness is higher. Broken mollusk shells and sand are usually accumulated in cavities, crevices and channels. The outcrop R3 lies between 12-14 m depth and BM, BA and PS between 19-23 m depth. The most remarkable difference in topography and composition of the sea floor is found in BA, due to the presence of a slope 1-1.5 m height (BAS) of consolidated sedimentary rocks (coquina with abundant shell fragments). Two shipwrecks constitute extensive ARs. The first one, the vessel James Clunies, is located on rocky bottoms in R2; the boiler remains in a vertical position up to 2 m from the seafloor (JCV), while the deck offers horizontal substrata (JCH). The other AR, the vessel Cristo Rey (CR), is located in soft bottoms near R3, offers numerous and discontinuous hard substrata of complex topography (Table 1). A total of 108 taxa were recorded in the study area, including 7 macroalgae, 98 invertebrates and 3 tunicates. Twenty one were the most conspicuous taxa both NR and AR and they were used in quantitative assessment of living cover of macrobenthic organisms (see above). The remainder species correspond mainly to small size organisms associated to mussel beds and/or epizoites on big clumps hydroid colonies. Other macrobenthic organisms were rarely observed due to their difficult detection because of scarce abundance or cryptic habits (Tables 2 and 3). The pattern of samples agrees with depth and position in the substrate (Fig. 2). A gradient from substrates exposed during exceptional low tides to deepest sites was observed. The outcrop R0, dominated by Corallina officinalis and Ulva lactuca (72 and 24% cumulative contribution respectively, SIMPER analysis), was clearly separated from the rest of the sampling sites, which followed a gradient from shallow to deep ones: R1, R2, R3, JCH, PS, BA (typical species Mytilus platensis, 69.0-99.2%), CR, BM and BAS (Tripalea clavaria 57.6-98.3%) (Fig. 3). No differences were found between horizontal AR and the adjacent NRs. Main differences were found between vertical vs. horizontal communities, both in NR and AR (BAS and JVC respectively) (Fig. 3, see Tables 4 and 5). JCV was slightly separated from the rest due to its distinct biological composition established in a vertical artificial substrate (Anthothoe chilensis 99.3%) (Fig. 3). Figure 2. MDS ordination of sites (natural and artificial reefs) using group average sorting of the Euclidean distance measure on physical data (substrate topography). Natural outcrops: Restingas Faro (R0), Primera (R1), Segunda (R2) and Tercera (R3), Banco Pescadores Sur (PS), Banco del Medio (BM), Banco de Afuera (BA) and the sedimentary slope in BA (BAS). Artificial reefs: James Clunies horizontal (JCH) and vertical (JCV), and Cristo Rey (CR). Figura 2. Ordenamiento MDS de los sitios (arrecifes naturales y artificiales) usando los promedios de la distancia Euclídea de los datos físicos (topografía del sustrato). Arrecifes naturales: Restingas Faro (R0), Primera (R1), Segunda (R2) y Tercera (R3), Banco Pescadores Sur (PS), Banco del Medio (BM), Banco de Afuera (BA) y elevación de roca sedimentaria en BA (BAS). Arrecifes artificiales (pecios): James Clunies horizontal (JCH) y vertical (JCV), y Cristo Rey (CR). Figure 3. MDS ordination of sites (natural outcrops and artificial reefs) using group average sorting of the Bray-Curtis similarity measures on cover data. Natural outcrops: Restingas Faro (R0), Primera (R1), Segunda (R2) and Tercera (R3), Banco Pescadores Sur (PS), Banco del Medio (BM), Banco de Afuera (BA) and the sedimentary slope in BA (BAS). Artificial reefs: James Clunies horizontal (JCH) and vertical (JCV), and Cristo Rey (CR). Figura 3. Ordenamiento MDS de los sitios (arrecifes naturales y artificiales) usando promedios de las medidas de similitud Bray-Curtis de los datos de cobertura. Arrecifes naturales: Restingas Faro (R0), Primera (R1), Segunda (R2) y Tercera (R3), Banco Pescadores Sur (PS), Banco del Medio (BM), Banco de Afuera (BA) y elevación de roca sedimentaria en BA (BAS). Arrecifes artificiales (pecios): James Clunies horizontal (JCH) y vertical (JCV), y Cristo Rey (CR). The best combination of structural features explaining the biological matrix (BIO-ENV) included the combination of the following variables: Fine Sediment, RI, Height and Depth (Sample statistic Rho: 0.495); RI, Height, Depth (Sample statistic Rho: 0.493) and Height and Depth (Sample statistic Rho: 0.490). Fifteen reef fish species were recorded during the 35 visual censuses conducted during this study. Species richness was lower in shallower outcrops than in deeper ones (8 vs. 14 species). 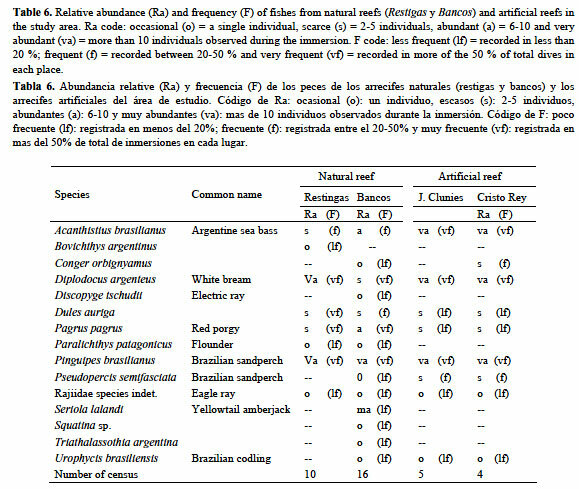 Six species were found in all AR and NR (Table 6). Overall, only 4 species (26.7% of the total) were classified as frequent or very frequent: Diplodocus argenteus, Pagrus pagrus, Dules auriga and Pinguipes brasilianus, the last one was the most abundant in all sites. Acanthistius brasilianus was recorded with highest abundance and frequency values in the shipwrecks (AR) but infrequent in the outcrops (NR), with the exception of caves and crevices from BAS. The few specimens of Pseudopercis semifasciata observed during the visual censuses were reported in the same cryptic habitats (AR and BAS). The remaining fish species occurred with low frequency, usually single specimens, with the exception of a large shoal of Seriola lalandei observed in the deep outcrops. Our results provide information on sublittoral faunal assemblages from unexplored locations of southwestern Atlantic coasts. The rocky outcrops in the area of Mar del Plata were composed by distinct benthic communities than those previously studied from nearby rocky intertidal and soft bottoms areas. The intertidal zones are dominated by the mytilid Brachidontes rodriguezi (Olivier et al., 1966; Penchaszadeh, 1973; Scelzo et al., 1996). On the other hand, subtidal coarse sandy adjacent areas between 18 and 25 m depth are dominated by the sea urchin Encope emarginata, while deeper and finer bottoms up to 64 m depth show the presence of Mytilus platensis banks of high species richness (Bremec & Roux, 1997). In the rocky outcrops herein studied, red calcareous algae dominated the shallowest NR while a conspicuous mytilid assemblage was present in NRs deeper than 3 m; sea anemones were more abundant between 6-10 m and soft-corals at nearly 20 m depth (Fig. 4). Epizoism was an important phenomenon in the area, mainly on sertulariid and plumulariid hydroids (see Table 1). Figure 4. Natural reefs dominated by the mussel Mytilus platensis. a) R2 (Dules auriga, a typical rocky outcrop fish, over mussel beds), b) R3 (the sea urchin Arbacia dufresneii and the sea star Asterina stellifer), c) BA (general view of the outcrop with some individuals of the Brazilian sandperch Pinguipes brasilianus) and d) BAS (mussels, the sea urchin A. dufresneii and the soft-coral Tripalea clavaria). R2: Segunda Restinga. R3: Tercera Restinga. BA: Banco de Afuera. BAS: sedimentary slope in BA. Scale bar: 10 cm. Figura 4. Arrecifes naturales dominados por el mejillón Mytilus platensis. a) R2 (Dules auriga, un típico pez de los arrecifes rocosos sobre banco de mejillones), b) R3 (el erizo de mar Arbacia dufresneii y la estrella de mar Asterina stellifer), c) BA (vista general del arrecife con algunos individuos del "turco" Pinguipes brasilianus) y d) BAS (mejillones, el erizo de mar A. dufresneii y el coral blando Tripalea clavaria). R2: Segunda Restinga. R3: Tercera Restinga. BA: Banco de Afuera. BAS: elevación sedimentaria en BA. Barra: 10 cm. A wide array of structural features is known to affect the settlement of benthic invertebrates onto natural and artificial substratum, including spatial orientation, structural complexity, substratum composition and texture (Moura et al., 2006; Perkol-Finkel et al., 2006; Thanner et al., 2006). 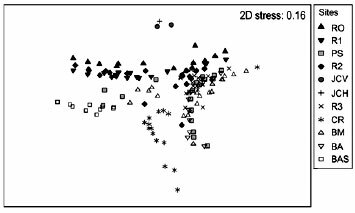 Community structures developed in horizontal AR (JCH) after nearly sixty years were similar to neighboring NR communities (R1 and R2), while dominant taxa differed notably within vertical or horizontal ARs and NRs. Perkol-Finkel et al. (2006) found that if submersion time is prolonged, ARs can mimic adjacent NRs only if they possess similar structural features. However, if they differ structurally, their communities will remain distinct. Our results are in accordance with previous works that demonstrated clear consistent differences, even considering long periods of AR submersion, between epibiotic assemblages settled on horizontal and vertical surfaces (Moura et al., 2006; Perkol-Finkel et al., 2006; Thanner et al., 2006). Proximity to the seafloor and shading can markedly influence the development of distinct epibiotic assemblages in subtropical and tropical waters (Glasby & Connell, 2001; Perkol-Finkel et al, 2006). Suspended particles are highly dependent on the existence of elevated structures mostly because the water current velocity increases when passing by the edge of them (Falcâo et al., 2009). The a zoo-xanthellate soft-coral Tripalea clavaria, which also occur in soft bottom up to 70 m depth, depends on the flow current to feed (Olivier et. al., 1968; Acuña et al., 2004). Thus, its abundance in BAS and CR could be explained by the vertical disposition of these substrata that affect the fluxes of suspended material. The small sea anemone Anthothoe chilensis monopolized the available artificial vertical substrata, i.e. 5000 ind m-2 in JCV (Fig. 5). Such high abundance could be explained by its preference to colonize substrata where water currents guarantee a continuous supply of food and avoid the negative effects of sedimentation. This species also occurs in dense patches in the intertidal fringe (Excoffon et al., 1997). Its higher abundances could be also favored by its reproductive strategy by longitudinal fission (Excoffon & Acuña, 1998). 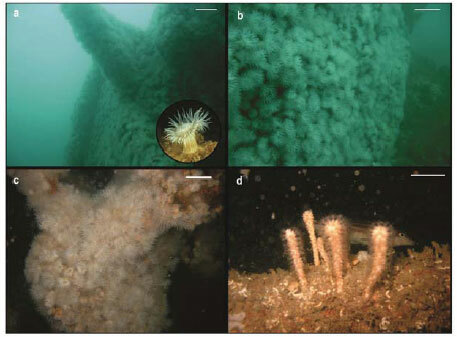 Other fast growing sea anemone, Metridium senile (Linnaeus, 1761), has a similar asexual mechanism and is usually found colonizing shipwrecks in other coastal temperate waters in Belgium (Zintzen et al., 2008) and Patagonia (G. Genzano, pers. obs.). Figure 5. Typical species colonizing the artificial reefs (shipwrecks) in the study area. a-b) the sea anemone Anthothoe chilensis in James Clunies vertical substrata (with a closer look to the species), c) the sea anemones in Cristo Rey, d) the soft-coral Tripalea clavaria in Cristo Rey. Scale bar: 10 cm. Figura 5. Especies típicas colonizando los arrecifes artificiales (pecios) en el área de estudio. a-b) la anémona de mar Anthothoe chilensis en el sustrato vertical del James Clunies (con vista detallada de la especie), c) las anémonas de mar en el Cristo Rey, d) el coral blando Tripalea clavaria en el Cristo Rey. Barra: 10 cm. In AR, spatial complexity increases habitat heterogeneity, providing increased areas of refuge for fish populations from predation and competition. Reef fishes also represent an attraction for recreational divers, and for sport angler fishers (Galván et al., 2009) . Fifteen species were recorded in the analyzed area. Abundance and frequency values registered by visual censuses for some species could be underestimated due to their particular behavior; e.g. Dules auriga and Bovichthys argentinus are two shy fishes which usually avoid divers and Triathalassothia argentina is a cryptic and sedentary species with nocturnal habits. However; the data clearly indicated that species having strong site fidelity, i.e. Acanthistius brasilianus (Irigoyen & Venerus, 2008) and Pseudopercis semifasciata, were clearly more abundant and/or frequent in ARs (shipwrecks) compared to the surrounding NRs, suggesting a preference for habitat with more complex structure. In NRs these species occur only in cliffs and crevices of BAS but they are rare or absent in the less structurally complex outcrops. This pioneer study in the surveyed area clearly shows that outcrops allow the settlement of diverse and rich assemblages. Artificial reefs allow not only the settlement of benthic invertebrates but also provide refuge for fishes. As recreational fishery and diving are intensifying its activities in Mar del Plata, where tourism is one of the main economical resources, the protection of such areas should be considered in conservation plans. Future management plans should have into account the frequency of dive-expeditions in these coastal habitats.